all while greatly reducing market risk as measured by volatility of returns. CPM is either long (risk on) or neutral (risk off): no short positions, leveraged longs, or hedging via derivatives. CPM is not a returns-driven model. It was primarily designed to protect investor assets during adverse market conditions while taking advantage of the market’s historical propensity to move higher over time. CPM utilizes 4 quantitative inputs. CPM uses the S&P 500 as a proxy for the market. CPM was designed to 1) be in the market as much as possible, 2) to protect assets during meaningful declines, and 3) to quickly move back to an aggressive stance once internal conditions improve. Since 2007, CPM has averaged 4.6 signals per year or approximately 1.2 per quarter. 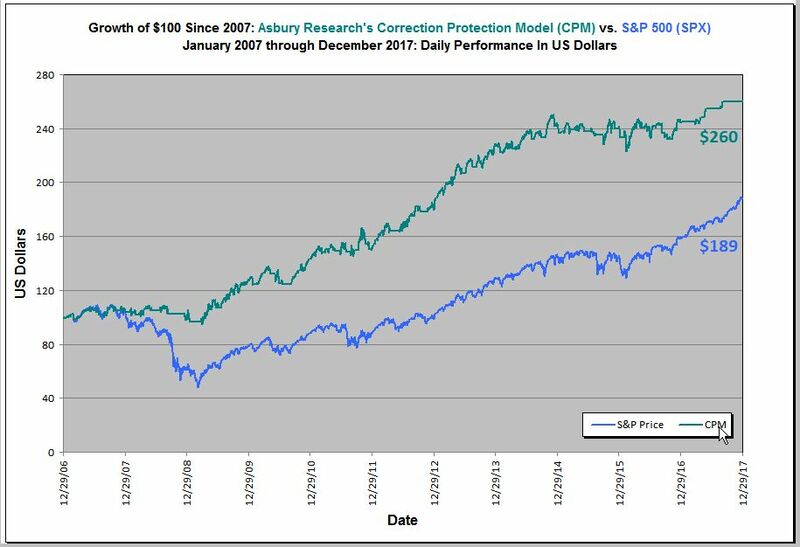 Since inception in 2007, the Correction Protection Model (CPM) has had a 13.0% CAGR (Compound Annual Growth Rate) with a volatility (standard deviation on a rolling 90 day basis) of 10.1%. During the same 11-year period the S&P 500 has had a CAGR of 8.7% with volatility of 19.4%. This means CPM is producing a significantly better return than SPX with about half the volatility. Further, Table 1 below shows the Reward/Risk Ratio (CAGR/volatility; a modified Sharpe Ratio) over a rolling 90 day period is 1.32 for CPM versus 0.45 for SPX. The table also indicates that the average return of CPM on a rolling 90 day basis since 2007 has been 3.31% compared to 2.45% for SPX. The model’s performance is directly attributable to its ability to limit downside risk as can be seen in CPM’s maximum drawdown of -9.81% on a rolling 90 day basis versus a maximum drawdown of -39.93% for SPX. Chart 1 below shows that $100 invested in CPM at the beginning of 2007 was worth $260 by the end of 2017. $100 invested in SPX was worth $189 during the same period. 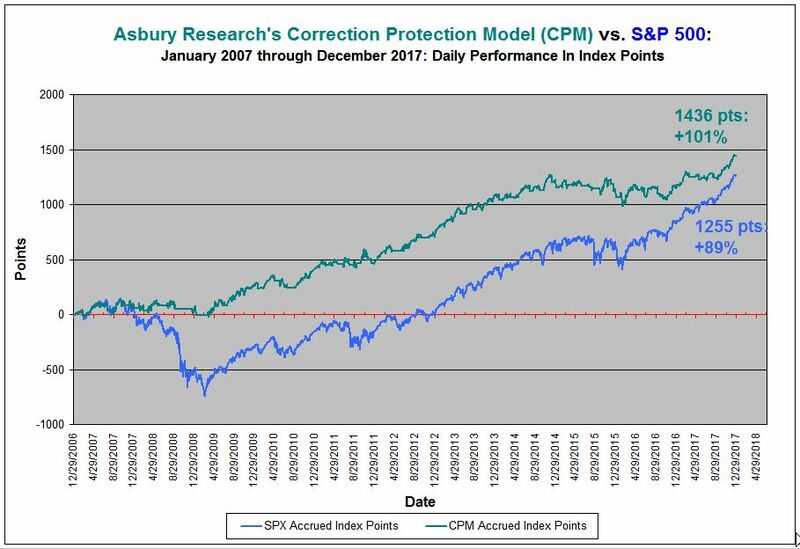 Chart 2 below displays the daily performance in index points for both CPM and SPX from January 2007 through December 2017. By this measure, CPM has outperformed SPX by 14.4% during this period by producing 1436 index points (a 101% appreciation since inception) versus 1255 points by the S&P 500 (an 89% appreciation during the same period) with, as mentioned earlier, about half the volatility of returns. All investment models have inherent limitations in that they look back over previous data but can’t see into the future, and CPM is no different. Past performance does not guarantee future results. These limitations aside, however, our model argues against the buy and hold “strategy” and the assertion by its proponents that “you can’t time the market” or “you can’t beat the market”. Attempting to get out of the way of an emerging market decline comes with the inherent risk of potentially missing out on some performance — especially considering the current “buy the dip” mentality engendered by a decade of stimulative Federal Reserve policy. However, our model’s performance since 2007 is a testament to intelligent quantitative risk management, showing that a conservative, systematic, and repeatable process of active management can over time significantly outperform passive buy and hold. This data is provided for information purposes only. Past performance or back-tested results may not necessarily indicate future results. The performance indicated from back-testing or historical track record may not be typical of future performance. No inferences may be made and no guarantees of profitability are being stated by Asbury Research LLC. The risk of loss trading in financial assets can be substantial. Therefore, you should therefore carefully consider whether such trading is suitable for you in light of your financial condition.